Attorney Larry Jacobs and Diane Rehm, former NPR radio journalist meet with WAMU supporters to discuss estate planning and planned giving. “What a treat and honor,” says Larry Jacobs, “to get a call from Diane Rehm asking me to sit down with WAMU supporters at her home to discuss estate planning with an emphasis on planned giving.” Those subjects are near and dear to Larry’s heart after more than 20 years of helping residents of Maryland, D.C. and Virginia plan for the future. Diane is well known to generations of public radio listeners in the Washington area and around the country. 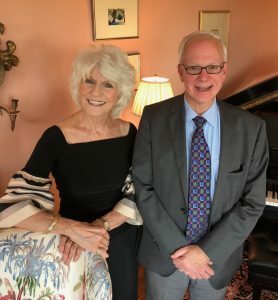 For decades, The Diane Rehm Show was an NPR fixture with two million listeners. Since stepping away from the daily microphone, Diane has taken a leadership role with The 1961 Society, recognizing individuals who include WAMU as a beneficiary in their estate plans. “One of my great passions is in opening my clients’ eyes to how they can have a lasting impact on organizations and causes that matter to them. WAMU frequently ranks high on those lists.” In fact, Larry’s numerous interactions with the planned giving team – as well as the bequest that he and his husband Steve have created for the station – brought him to Diane’s attention. That friendly but straightforward approach is a hallmark of Larry’s practice, and all of us at McMillan Metro congratulate him on this wonderful chance to showcase his skills. If you have questions about estate planning – especially whether to include WAMU or any other organization in your documents – contact Larry at (240) 778-2330.